Ennobled by improbable facial hair and dignified with cavernous vocal chords, The Spooky Men's Chorale have been gleefully smashing up and reassembling the world of men's singing since 2001, when they emerged from the Blue Mountains in Australia. They employ a devastating combination of immaculate musical sensibilities, hair-raising deep harmonies and extreme silliness to explore the paradoxes of latter day masculinity. Compellingly comic they may be but make no mistake, this is a class act. Pitch perfect harmonies, theatrical delivery, savvy lyrics, imaginations that run riot and men who really can multi-task! The repertoire, which began with a simple combination of Georgian table songs, immaculate ballads and vaudevillian nonsense, has expanded to include sly and witty commentary on their own favourite body parts, a surfing anthem, and a mock Sufi ode to the Bee Gees - all performed with passion and a twinkle in the eye. Their last UK tour saw a large number of sell-out concerts at major venues and a whole raft of ecstatic festival audience reactions. The Spookies will now continue their long, slow global conquest with a 7th visit to these isles, and a step-up in their supernova trajectory with some major festival dates. The Spooky Men's Chorale play The Apex on Monday 10 July at 7.30pm. 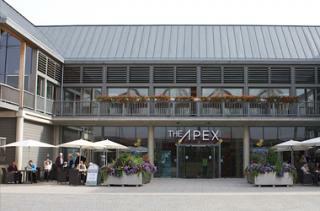 Tickets are £20, ring the box office on 01284 758000 or see the website - www.theapex.co.uk for details.